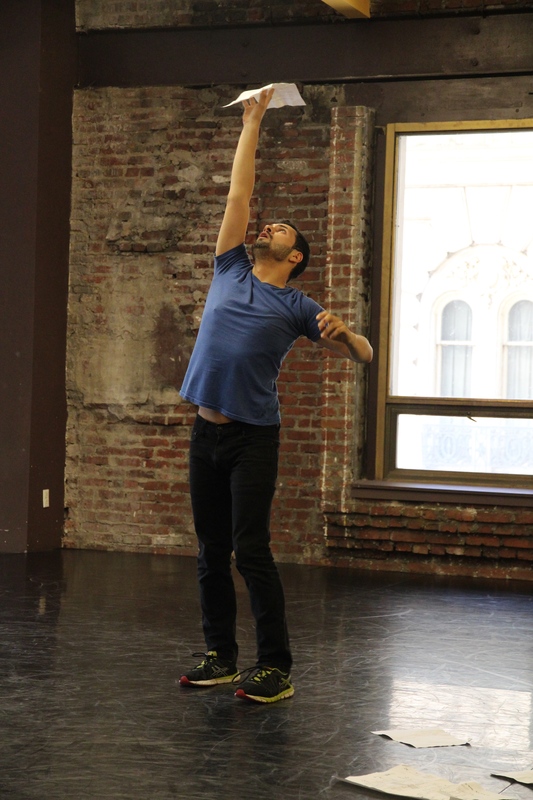 Adrian Plascencia is a dancer in Supper, People on the Move. In preparation for this interview, I called my mom who is now living in California. The phone conversation lasted much longer than our average conversations of five minutes, which usually include mundane updates about weather and work. We rarely speak of our personal lives so my interest in the details of her story into this country was jarring for her to recount at first, but slowly she began to soften and I could hear her voice warm and she recounted the memories of her youthful journey to this new country. Our being in the United States is more my dad’s effort than anyone else’s. He had always thought of coming to the U.S. as a young man, so when a group of his friends were ready to make the dangerous trip to the border my dad was ready to join them. He was nervous to tell his family that he would be leaving but after an explosive argument with his oldest brother his decision was clear and he was on his way to the border the next day. He was seventeen. Once in the U.S. he got a job working at a tortilla factory and there he stayed for six years. One day, the factory was raided by immigration officials and my dad was deported back across the boards to Tijuana. He immediately returned to the U.S. A week later the officials came back and deported him again. (I should say, that the details of my dad’s crossing into the country are unclear since he was very private about them and never revealed these stories to either my mom or us children before his death late last year.) Upon my dad’s second deportation in a week he decided to go back to his hometown of Léon Guanajuato and it was during his time back there that he met my mother. They got married and quickly had two children, my older brother and me. My dad had still wanted to have a life in the United States and dreamed of going back while my they were still dating but my mom was not into the idea of living in the U.S.
Now married, my father insisted on going back to help support his family and my mom let him go on the condition that it would only be for a year and then he would return. My dad left in January of 1988, just one month after I was born. He and my mom would call each other every week on Sunday evenings to stay connected during this long time apart. After a year, my mom had had enough of the distance and declared that either he return to Mexico or she would go to the U.S. Not wanting to give up what he had spent so much time building up, my dad got off the phone and immediately began making arrangements for his family to come and meet him on the American side of the border. By the next day it was all arranged; my mom would take a bus to the airport and fly from Aguascalientes to Tijuana. Once in Tijuana she would meet with a man who would give her false credentials to pose as an American who was simply visiting Mexico and now returning to the U.S. My brother and I would then be passed on to different families and pose as children of these American parents returning to the country. We would all rendezvous at in San Diego with my dad and from there drive up to the San Francisco Bay Area where my dad had lived for the past year. My brother, who was three at the time, was coached to give a false name if he was asked by an immigration official. I was a little over a year old and was given allergy medication to sleep through the entire experience and not raise suspicion by crying in the arms of a woman that wasn’t my mother. We both crossed the border as planned as a part of separate families. My mom, however, got held up when they discovered that her credentials were false. She was rejected entry into the country and was asked to turn around and go back to Mexico. They now had to decide on a different and possible more dangerous method of crossing her over. That night she was packed tightly into a small car with four other women who had found themselves in the same situation of not being about to cross the border on their first attempts. The car drove through a less patrolled area of the border and they were dropped off on a dark beach and told to walk to a 7-eleven four hours away. This long, late night trek was challenging for my mom. She had had asthma since she was very young and this made it hard to breathe in the cold night air. Dry coughs exploded out of her and she tried to muffle them with the thin sweater she was wearing but the other women with her urged her to remain silent on the quiet beach. There was no way for them to communicate to anyone that they had arrived at their 7-eleven rendezvous point; they were just left to wait. The wait for my mom wasn’t long, as she recalls, and was picked up and driven to where my dad, brother, and myself had arrived the day before. When my mother got to us she says that my brother would not respond to his own name for a week and would instead “correct” people by telling them that his name was the one he was coached to say. For me, the effects of the allergy pill worked well and I didn’t not wake up for more than 24 hours. From our meeting place in San Diego we drove up to San Mateo in Northern California where we were welcomed into my father’s one bedroom, fully finished apartment. My mother remembers these first few days in the United States as very odd. She had been in a relationship with my dad for some time by this point but they had been separated for a year. Not only by distance but by culture and experience. In that year my mom had to raise a newborn while having a toddler that was not yet two and was surrounded by family for support. The environment, landscape, people, language, were all different now and the only link to this world was a man that had only been a voice over the phone for the last year. My dad had always been more independent and had grown accustomed to the way things worked here. He was enjoying his life and the new adventures that this country offered him. My dad was granted amnesty in 1989, which meant he received a Permanent Resident Visa or green card. He then took advantage of the Family Reunification laws at the time to grant my mom and both me and my brother permanent resident statuses as well. By 1994 we were all legal residents. In 2001 my mother applied for American Citizenship and after passing her exam was granted citizenship as well as citizenship for me and my older brother. My younger brother was born in the U.S. in 1995 and is the only one in our family who is a naturalized citizen. As for my father, he chose never to become an American Citizen. He maintained a head strong loyalty to his Mexican Nationality and would not let himself assimilate too much into American culture. My dad never fully grasped the language and would get upset when my brothers and I would speak English around him. He encouraged us to maintain a close link to our Mexican heritage. We attended Spanish church services so all I know about the Catholic church that I was raised in is in Spanish. All prayers and rituals I only know through a Hispanic filter. After working in a tortilla factory for so many years, my father decided to start his own business. It is a successful small business in San Mateo, California, that my older brother now runs after my dad’s passing in 2014. He had always wanted to return to Mexico, so when he died he was cremated and his remains were flown back to his home town and set in the same church where he was baptized, confirmed, and married. For my parents, their families were always a major part of their lives but for my brothers and myself we never really connected with our larger extended family. My mom is one of fifteen and my dad one of eight so there was a lot of family that we kids never really got to know given that we lived so far away and only visited once every couple of years. We grew up in a completely different world and were privileged with many different opportunities and could not in our naive young heads think of why everyone didn’t just move to the U.S. because things are clearly so much better here. To them we were a part of the large set of dozens of cousins and nephews that made up this family but to us they were strangers. Family we never saw and were pushed into hugging and kissing after quickly connecting the dots from mom or dad to generic relative. They all knew their roles well in the larger family dynamic but I felt out of place with my only real connections being between my brothers. There was no reference point to this world that they lived in or any link to their familiar characters. Our Spanish, though fluent, was not good enough to catch references to popular culture or trends in slang. We got lost when it came to jokes and grammatical word play. Though I was born in Mexico, it was not my home. The Mexico of my parents was not my Mexico. I am beyond grateful for the journey and struggles that my parents went through to get into this country and to create a life for our family here. This project has opened my eyes to the true peril that came in the decision to cross the border and I am honored to be a part of it. Que estemos en los Estados Unidos se debe más al esfuerzo de mi padre que al de cualquier otra persona. De joven siempre había pensado en venir a los Estados Unidos, así que cuando un grupo de sus amigos estuvo listo para hacer el peligroso viaje a la frontera, mi padre estaba preparado para unirse a ellos. Tenía 17 años. Ya en los Estados Unidos, consiguió empleo en una fábrica de tortillas, y trabajó allí durante 6 años. Un día, los funcionarios de inmigración allanaron la fábrica y mi padre fue deportado a Tijuana, cruzando la frontera. Volvió de inmediato. Una semana después, los oficiales regresaron y lo deportaron nuevamente. Luego de la segunda deportación, mi padre decidió regresar a su ciudad natal, León Guanajuato, y fue allí donde conoció a mi madre. Se casaron y al poco tiempo tuvieron dos hijos, mi hermano mayor y yo. Mientras estaban saliendo, mi papá todavía quería hacer su vida en los Estados Unidos y soñaba con regresar, pero a mi madre no le gustaba la idea de vivir allí. Ahora estaban casados y mi padre insistía en volver para ayudar a mantener a su familia; mi madre se lo permitió con la condición de que solo fuera por un año. Mi papá se fue en enero de 1988, apenas un mes después de que yo naciera. Él y mi mamá se llamaban todos los domingos por la tarde para seguir en contacto. Después de un año, mi mamá se cansó de la distancia y le dijo que él volviera a México o ella iría a los EE. UU. Como no quería renunciar a todo aquello que le había llevado tanto tiempo construir, mi padre colgó el teléfono e inmediatamente comenzó a hacer arreglos para que su familia fuera a encontrarse con él del lado estadounidense de la frontera. Al día siguiente, todo estaba arreglado: mi madre tomaría un autobús al aeropuerto y volaría de Aguascalientes a Tijuana. Una vez llegada a Tijuana, se encontraría con un hombre que le daría credenciales falsas para hacerse pasar por estadounidense. Luego, pondrían a mi hermano y a mí con diferentes familias y nos harían pasar por hijos de estos padres estadounidenses que regresan a su país. Nos reuniríamos todos en San Diego con mi padre y desde allí conduciríamos hasta el área de la Bahía de San Francisco, donde mi papá había vivido. En ese momento, mi hermano tenía tres años y lo entrenaron para dar un nombre falso en caso de que un funcionario de migraciones le preguntara. Yo tenía poco más de un año y me dieron medicamentos para la alergia para que durmiera durante toda la experiencia y no levantara sospechas al llorar en brazos de una mujer que no era mi madre. Ambos cruzamos la frontera tal como estaba planeado, como parte de familias separadas. Mi mamá, sin embargo, fue detenida cuando descubrieron que sus credenciales eran falsas. Le denegaron la entrada al país y le dijeron que tenía que regresar a México. Ahora tenían escoger un método diferente y, posiblemente más peligroso, para cruzarla. Esa noche viajó apretada en un automóvil pequeño con otras cuatro mujeres que tampoco habían podido cruzar la frontera en sus primeros intentos. El automóvil pasó por una zona menos patrullada de la frontera; las dejaron en una playa oscura y les dijeron que caminen hasta un supermercado que quedaba a cuatro horas. Cuando mi madre llegó, dice que mi hermano no respondió a su propio nombre durante una semana y que, en cambio, “corregía” a las personas aclarándoles que su nombre era el que le habían entrenado para decir. En mi caso, los efectos de la píldora para la alergia funcionaron bien y no me desperté durante más de 24 horas. Mi madre recuerda que aquellos primeros días en los Estados Unidos le parecieron muy extraños. Para aquel entonces, ella había estado en una relación con mi padre durante un tiempo pero llevaban un año separados. No solo entre ellos, sino también de su familia, que era su apoyo. Ahora el entorno, el paisaje, las personas, el idioma, todo era diferente y el único vínculo con este mundo era un hombre que solo había sido una voz en el teléfono durante el último año. Mi padre siempre había sido más independiente y disfrutaba de su vida y de las nuevas aventuras que el país tenía para ofrecerle. A mi padre se le concedió la amnistía en 1989, lo que significaba recibir una visa de Residencia Permanente o una tarjeta verde. Más tarde, aprovechó las leyes de Reunificación Familiar de ese momento para otorgarnos también a mi madre, a mi hermano y a mí el estatus de residentes permanentes. En 1994, ya todos éramos residentes legales. En 2001, mi madre solicitó la ciudadanía estadounidense y, después de aprobar su examen, le concedieron la ciudadanía tanto a ella como a mí y a mi hermano mayor. Mi hermano menor nació en los EE. UU. en 1995, y es el único en nuestra familia que es ciudadano de nacimiento. En cuanto a mi padre, él decidió nunca convertirse en ciudadano estadounidense. Mantuvo una firme lealtad a su nacionalidad mexicana y no se permitió adaptarse demasiado a la cultura estadounidense. Después de trabajar en una fábrica de tortillas, decidió comenzar su propio negocio. Es una pequeña empresa exitosa en San Mateo, California, que mi hermano mayor lleva adelante desde la muerte de mi papá, en 2014. Él siempre había querido regresar a México, por eso, cuando murió, fue cremado y sus cenizas llevadas a su ciudad natal, a la misma iglesia donde se bautizó, se confirmó y se casó. Cuando le pregunté a mi madre si todo esto había valido la pena, me contestó desanimada que aún no lo sabía. Para mis padres, sus familias siempre fueron una parte importante de sus vidas, pero mis hermanos y yo nunca nos relacionamos de verdad con nuestra gran familia extendida. Aunque nací en México, no fue mi hogar. El México de mis padres no era mi México. Estoy más que agradecido por el viaje y las dificultades que pasaron mis padres para llegar a este país y crear aquí una vida para nuestra familia. Portraits of People on the Move tells the stories of Philadelphia-area immigrants through their own words on the Supperdance.com blog and was first shown as an exhibition in 2015, at the Gray Area of Crane Arts in Philadelphia. The exhibition was created as a companion work to Supper, People on the Move by Cardell Dance Theater, a dance inspired by themes of migration.